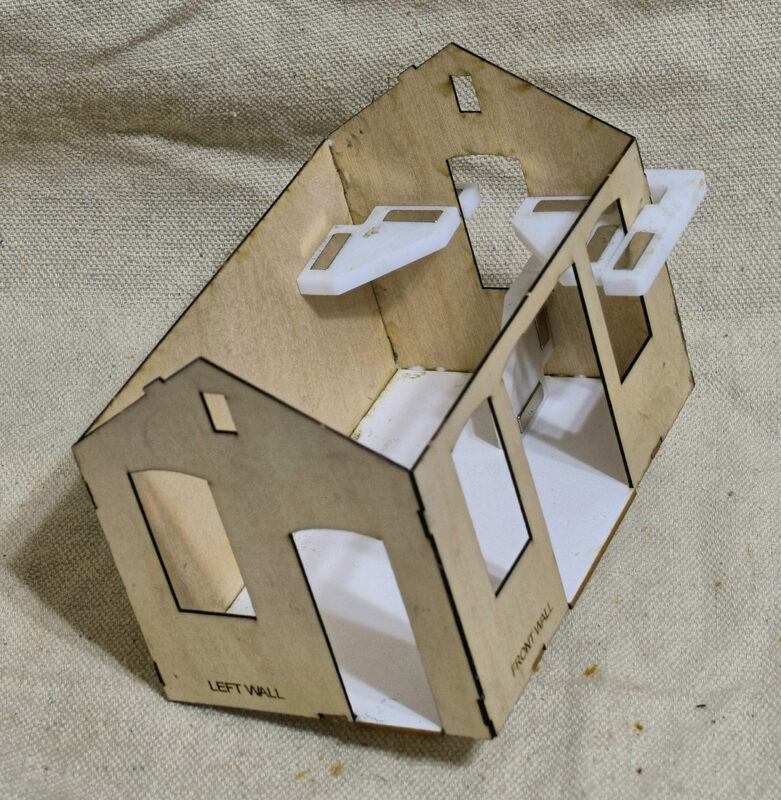 This was the ‘proof build’ for the O scale kit. I found a couple of errors in the instructions .. most had already been corrected by the time I emailed Walt Gillespie of them. 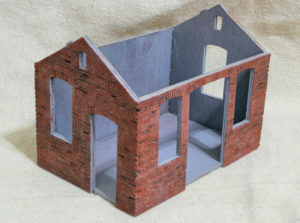 You could of course use this structure for whatever you wish but I am going to stick with it being a pump house. One thing I would do different/additional would be to do some measuring of the width and length of of the shell. I ended up slightly larger than I wanted/wished . perhaps .020″ .. think it would have been worth the time to make up a simple jig to the length and width needed and some simple sanding would make the fit exact. Hey .. lessons learned and all that. 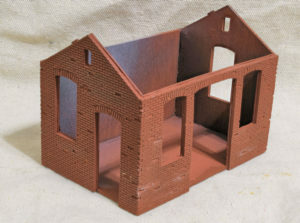 The brick work is laser cut. The ends of the walls interlock as I said like finger joints in wood carpentry. This was fine on three sides .. the slight gap at one corner ..which was strictly me not being as precise as I should have been with the shell. 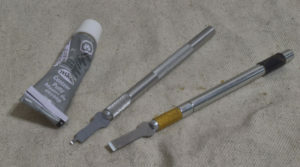 I ended up filling the gap with Contour Putty then re-cutting the mortar lines with X-Acto #17 blades while the putty was still relatively soft. I ground one blade down to fit the brick height. This was also used to chip away at brick in the wall to severely ‘weather’ it. This is where I was at this point. After this photo I sprayed a flat red primer and then tried several techniques .. chalk, thinned paint etc. to create the mortar lines and were not happy with the results. I decided to re-spray with a gray primer (to simulate mortar) and dry-brush the red. The ‘red’ is a mix of cheap Apple Barrel Red and Brown oxide acrylics. I followed this with vallejo Dark Gray wash applied as a pinwash here and there .. and there ..
Now. I am reminded of the Bard’s ‘Comedy of Errors’. 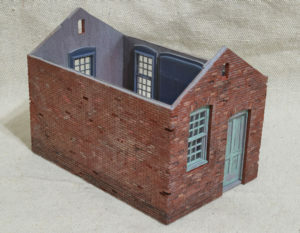 I had all the windows and doors painted and glued in place (except for the vents at the top .. think my cat ate those. Will probably just use some copper screen for those that I have). 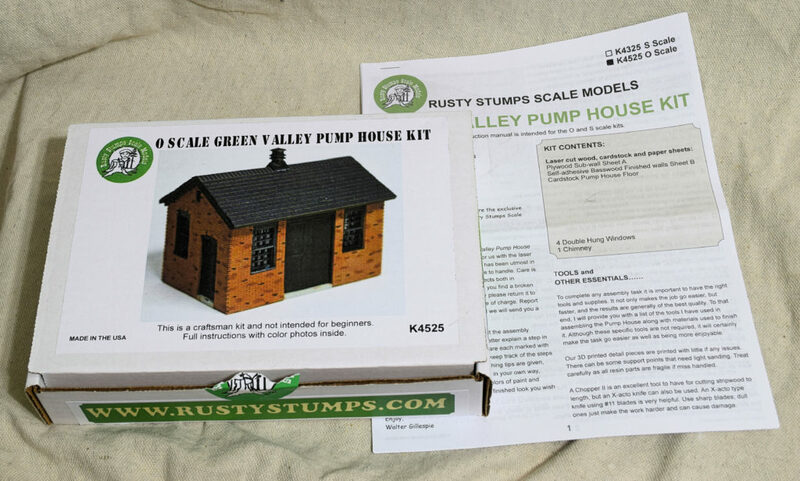 I started to look at where I could use this on my layout and finally realized that I needed the front of the building to face the track with the back to my river .. it IS a pump house after all. I of course (this is where the ‘Comedy of Errors’ comes into play) .. had only left the back with a coat of flat red since the back would not be seen. I had to go back and do the weathering etc., paint and so on. I used some Apple Barrel Khaki mixed with the red oxide to color individual bricks followed b some more dark wash to tone them down. I used the X-Acto blades to pry at the bricks on the base and darked them a lot. Later … pipes will come out of this wall and drop down to the river.